Roman emperor, born in 146 at Leptis Magna on the coast of Africa. Punic was still the language of this district, and Severus was the first emperor who had learned Latin as a foreign tongue. The origin of his family is obscure. Spartianus, his biographer in the Historia Augusta, doubtless exaggerates his literary culture and his love of learning; but the taste for jurisprudence which he exhibited as emperor was probably instilled into him at an early age. 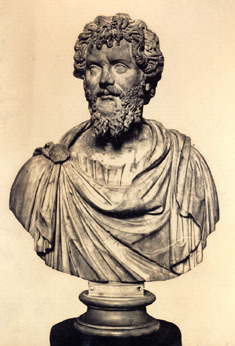 The removal of Severus from Leptis to Rome is attributed by his biographer to the desire for higher education, but was also no doubt due in some degree to ambition. From the emperor Marcus Aurelius he early obtained, by intercession of a consular uncle, the distinction of the broad purple stripe. At twenty-six, that is, almost at the earliest age allowed by law, Severus attained the quaestorship and a seat in the senate, and proceeded as quaestor militaris to the senatorial province of Baetica, in the Peninsula. While Severus was absent in Africa in consequence of the death of his father, the province of Baetica, disordered by Moorish invasions and internal commotion, was taken over by the emperor, who gave the senate Sardinia in exchange. On this Severus became military quaestor of Sardinia. His next office, in 174 or 175, was that of legate to the proconsul of Africa, and soon after he was tribune of the plebs. This magistracy, though far different from what it had been in the days of the republic, was still one of dignity, and brought promotion to a higher grade in the senate. In 178 or 179 Severus became praetor by competition for the suffrages of the senators. Then, probably in the same year, he went to Hispania Citerior as legatus juridicus; after that he commanded a legion in Syria. After the death of Marcus Aurelius he was unemployed for several years, and, according to his biographer, studied at Athens. He became consul about 189. In this time also falls the marriage with his second wife, afterwards famous as Julia Domna, whose acquaintance he had no doubt made when an officer in Syria. Severus was governor in succession of Gallia Lugdunensis, Sicily and Pannonia Superior; but the dates at which he held these appointments cannot be determined. He was in command of three legions at Carnuntum, the capital of the province last named, when news reached him that Commodus had been murdered by his favorite concubine and his most trusted servants. Up to this moment Severus had not raised himself above the usual official level. He had seen no warfare beyond the petty border frays of frontier provinces. But the storm that now tried all official spirits found his alone powerful enough to brave it. Three imperial dynasties had been ended by assassination. The Flavian line had enjoyed much shorter duration and less prestige than the other two, and the circumstances of its fall had been peculiar in that it was probably planned in the interest of the senate, and the senate reaped the immediate fruits. But the crises which arose on the deaths of Nero and of Commodus were alike. In both cases it was left to the army to determine by a struggle which of the divisional commanders should succeed to the command-in-chief, that is, to the imperial throne. In each case the contest began with an impulsion given to the commanders by the legionaries themselves. The soldiers of the great commands competed for the honor and advantages to be won by placing their general on the throne. The officer who refused to lead would have suffered the punishment of treason. There is a widespread impression that the Praetorian guards at all times held the Roman empire in their hands, but its erroneousness is demonstrated by the events of the year 193. For the first time in the course of imperial history the Praetorians presumed to nominate as emperor a man who had no legions at his back. This was Pertinax, who has been well styled the Galba of his time -- upright and honorable to severity, and zealous for good government, but blindly optimistic about the possibilities of reform in a feeble and corrupt age. After a three months' rule he was destroyed by the power that lifted him up. According to the well-known story, true rather in its outline than in its details, the Praetorians sold the throne to Didius Julianus. But at the end of two months both the Praetorians and their nominee were swept away by the real disposers of Roman rule, the provincial legions. Four groups of legions at the time were strong enough to aspire to determine the destiny of the empire those quartered in Britain, in Germany, in Pannonia and in Syria. Three of the groups took the decisive step, and Severus in Pannonia, Pescennius Niger in Syria, Clodius Albinus in Britain, received from their troops the title of Augustus. Severus outdid his rivals in promptness and decision. He secured the aid of the legions in Germany and of those in Illyria. These, with the forces in Pannonia, made a combination sufficiently formidable to overawe Albinus for the moment. He probably deemed that his best chance lay in the exhaustion of his competitors by an internecine struggle. At all events he received with submission an offer made by Severus, who confirmed Albinus in his power and bestowed upon him the title of Caesar, making him the nominal heir-apparent to the throne. Before the action of Severus was known in Rome, the senate and people had shown signs of turning to Pescennius Niger, that he might deliver them from the poor puppet Didius Julianus and avenge on the Praetorians the murder of Pertinax. Having secured the cooperation or neutrality of all the forces in the western part of the empire, Severus hastened to Rome. To win the sympathy of the capital he posed as the avenger and successor of Pertinax, whose name he even added to his own, and used to the end of his reign. The feeble defenses of Julianus were broken down and the Praetorians disarmed and disbanded without a blow. A new body of household troops was enrolled and organized on different principles from the old. In face of the senate, as Dio tells us, Severus acted for the moment like "one of the good emperors in the olden days." After a magnificent entry into the city he joined the senate in execrating the memory of Commodus, and in punishing the murderers of Pertinax, whom he honored with splendid funeral rites. He also encouraged the senate to pass a decree directing that any emperor or subordinate of an emperor who should put a senator to death should be treated as a public enemy. But he refrained from asking the senate to sanction his accession. The rest of Severus' reign is in the main occupied with wars. The power wielded by Pescennius Niger, who called himself emperor, and was supposed to control one-half of the Roman world, proved to be more imposing than substantial. The magnificent promises of Oriental princes were falsified as usual. Niger himself, as described by Dio, was the very type of mediocrity, conspicuous for no faculties, good or bad. This character had no doubt commended him to Commodus as suited for the important command in Syria, which might have proved a source of danger in abler hands. The contest between Severus and Niger was practically decided after two or three engagements, fought by Severus' officers. The last battle, which took place at Issus, ended in the defeat and death of Niger (194). After, this the emperor spent two years in successful attacks upon the peoples bordering on Syria, particularly in Adiabene and Osrhoene. Byzantium, the first of Niger's possessions to be attacked, was the last to fall, after a glorious defense. Late in 196 Severus turned westward, to reckon with Albinus. He was better born and better educated than Severus, but in capacity far inferior. As Severus was nearing Italy he received the news that Albinus had been declared emperor by his soldiers. The first counter-stroke of Severus was to affiliate himself and his elder son to the Antonines by a spurious and posthumous adoption. The prestige of the old name, even when gained in this illegitimate way, was evidently worth much. Bassianus, the elder son of Severus, thereafter known as Aurelius Antoninus, was named Caesar in place of Albinus, and was thus marked out as successor to his father. Without interrupting the march of his forces, Severus contrived to make an excursion to Rome. Here he availed himself with much subtlety of the sympathy many senators were known to have felt for Niger. Though he was so far faithful to the decree passed by his own advice that he put no senator to death, yet he banished and impoverished many whose presence or influence seemed dangerous or inconvenient to his prospects. Of the sufferers probably few had seen or communicated with Niger. The collision between the forces of Severus and Albinus was the most violent that had taken place between Roman troops since the contest at Philippi. The decisive engagement was fought in February of the year 197 on the plain between the Rhone and the Sa�ne, to the north of Lyons, and resulted in a complete victory for Severus. Thus, released from all need for disguise, he "poured forth on the civil population all the wrath which he had been storing up for a long time" (Dio). He frightened the senate by calling himself the son of Marcus and brother of Commodus, whom he had before insulted. He read a speech in which he declared that the severity and cruelty of Sulla, Marius and Augustus had proved to be safer policy than the clemency of Pompey and Julius Caesar, which had wrought their ruin. He ended with an apology for Commodus and bitter reproaches against the senate for their sympathy with his assassins. Over sixty senators were arrested on a charge of having adhered to Albinus, and half were put to death. In most instances the charge was a pretence to enable the emperor to crush the forward and dangerous spirits in the senate. The murderers of Commodus were punished; Commodus himself was deified; and on the monuments from this time onward Severus figures as the brother of that reproduction of all the vice and cruelty of Nero with the refinement left out. The next years (197-202) were devoted by Severus to one of the dominant ideas of the empire from its earliest days -- war against the Parthians. The results to which Trajan and Lucius Verus had aspired were now fully attained, and Mesopotamia was definitely established as a Roman province. Part of the time was spent in the exploration of Egypt, in respect of which Dio takes opportunity to say that Severus was not the man to leave anything human or divine uninvestigated. The emperor returned to a well-earned triumph, commemorated to this day by the arch in Rome which bears his name. During the six years which followed (202-208) Severus resided at Rome and gave his attention to the organization of the empire. Severus had confided much of the administration of the empire to Plautianus, the commander of the reorganized Praetorians, who is described by the ancient historians as a second Sejanus. In 203 Plautianus fell, owing, it is said, to an intrigue set on foot by Caracalla, who had shortly before married the daughter of his victim. Severus spent the last three years of his life (208-211) in Britain, amid constant and not very succeasful warfare, which he is said to have provoked partly to strengthen the discipline and powers of the legions, partly to wean his sons from their evil courses by hard military service. He died at York on the 4th of February 211. There are traditions that his death was in some way hastened by Caracalla. This prince had been, since about 197, nominally joint emperor with his father, so that no ceremony was needed for his recognition as monarch. The natural gifts of Severus were of no unusual order. He had a clear head, promptitude, resolution, tenacity and great organizing power, but no touch of genius. That he was cruel cannot be questioned, but his cruelty was of the calculating kind, and always directed to some end. He threw the head of Niger over the ramparts of Byzantium, but merely as the best means of procuring a surrender of the stubbornly defended fortress. The head of Albinus he exhibited at Rome, but only as a warning to the capital to tamper no more with pretenders. The children of Niger were held as hostages and kindly treated so long as they might possibly afford a useful basis for negotiation with their father; when he was defeated they were killed, lest from among them should arise a claimant for the imperial power. Stern and barbarous punishment was always meted out by Severus to the conquered foe, but terror was deemed the best guarantee for peace. He felt no scruples of conscience or honor if he thought his interest at stake, but he was not wont to take an excited or exaggerated view of what his interest required. He used or destroyed men and institutions alike with cool judgment and a single eye to the secure establishment of his dynasty. The few traces of aimless savagery which we find in the ancient narratives are probably the result of fear working on the imagination of the time. As a soldier Severus was brave, but he can hardly be called a general, in spite of his successful campaigns. He was rather the organizer of victory than the author of it. The operations against Niger were carried out entirely by his officers. Dio even declares that the final battle with Albinus was the first at which Severus had ever been present. When a war was going on he was constantly travelling over the scene of it, planning it and instilling into the army his own pertinacious spirit, but the fighting was usually left to others. His treatment of the army is the most characteristic feature of his reign. He broke with the decent conventions of the Augustan constitution, ignored the senate, and based his rule upon force. The only title he ever laid to the throne was the pronunciamiento of the legions, whose adherence to his cause he commemorated even on the coinage of the realm. The legions voted him the adopted son of Marcus Aurelius; the legions associated with him Caracalla in the government of the empire. Severus strove earnestly to wed the army as a whole to the support of his dynasty. He increased enormously the material gains and the honorary distinctions of the service, so that he was charged with corrupting the troops. Yet it cannot be denied that, all things considered, he left the army of the empire more efficient than he found it. He increased the strength of it by three legions, and turned the Praetorians, heretofore a flabby body without military experience or instinct, into a chosen corps of veterans. Their ranks were filled by promotion from all the legions on service, whereas previously there had been special enlistment from Italy and one or two of the neighboring provinces. It was hoped that these picked men would form a force on which an emperor could rely in an emergency. But to meet the possibility of a legionary revolt in the provinces, one of the fundamental principles of the Augustan empire was abrogated: Italy became a province, and a legion was quartered at Alba Fucens under the direct command of the emperor. Further to obviate the risk of revolution, the great commands in the provinces were broken up, so that, excepting on the turbulent eastern frontier, it was not possible for a commander to dispose of troops numerous enough to render him dangerous to the government. But, while the policy of Severus was primarily a family policy, he was by no means careless of the security and welfare of the empire. Only in one instance, the destruction of Byzantium, did he weaken its defenses for his own ends -- an error for which his successors paid dearly, when the Goths came to dominate the Euxine. The troublesome Danubian regions received the special attention of the emperor, but all over the realm the status and privileges of communities and districts were recast in the way that seemed likely to conduce to their prosperity. The administration acquired more and more of a military character, in Italy as well as in the provinces. Retired military officers now filled many of the posts formerly reserved for civilians of equestrian rank. The praefect of the Praetorians received large civil and judicial powers, so that the investment of Papinian with the office was less unnatural than it seems at first sight. The alliance between Severus and the jurisconsults had important consequences. While he gave them new importance in the body politic, and cooperated with them in the work of legal reform, they did him material service by working an absolutist view of the government into the texture of Roman law. Of the legal changes of the reign, important as they were, we can only mention a few details. The emperor himself was a devoted and upright judge, but he struck a great blow at the purity of the law by transferring the exercise of imperial jurisdiction from the forum to the palace. He sharpened in many respects the law of treason, put an end to the time-honored quaestiones perpetuae, altered largely that important section of the law which defined the rights of the fiscus, and developed further the social policy which Augustus had embodied in the lex Julia de adulteriis and the lex Papia Poppaea. Severus boldly adopted as an official designation the autocratic title of dominus, which the better of his predecessors had renounced. During his reign the senate was powerless; he took all initiative into his hands. He broke down the distinction between the servants of the senate and the servants of the emperor. All nominations to office or function passed under his scrutiny. The estimation of the old consular and other republican titles was diminished. The growth of capacity in the senate was checked by cutting off the tallest of the poppy-heads early in the reign. The senate became a mere registration office for the imperial determinations, and its members, as has been well said, a choir for drawling conventional hymns of praise in honor of the monarch. Even the nominal restoration of the senate's power at the time of Alexander Severus, and the accession of so-called "senatorial emperors" later on, did not efface the work of Septimius Severus, which was resumed and carried to its fulfilment by Diocletian. No period in the history of Latin literature is so barren as the reign of Severus. Many later periods -- the age of Stilicho, for example -- shine brilliantly by comparison. The only great Latin writers are the Christians Tertullian and Cyprian. The Greek literature of the period is richer, but not owing to any patronage of the emperor, except perhaps in the case of Dio Cassius, who, though no admirer of Severus, attributes to encouragement received from him the execution of the great historical work which has come down to our time. The numerous restorations of ancient buildings and the many new constructions carried out by Severus show that he was not insensible to the artistic glories of the past; and he is known to have paid much attention to works of art in foreign countries where his duties took him. But he was in no sense a patron or connoisseur of art. As to religion, if we may trust Dio, one of the most superstitious of historians, Severus was one of the most superstitious of monarchs. But apart from that it is difficult to say what was his influence on the religious currents of the time. He probably did a good deal to strengthen and extend the official cult of the imperial family, which had been greatly developed during the prosperous times of the Antonines. But what he thought of Christianity, Judaism or the Oriental mysticism to which his wife Julia Domna gave such an impulse in the succeeding reign, it is impossible to say. We may best conclude that his religious sympathies were wide, since tradition has not painted him as the partisan of any one form of worship. Severus himself wrote an autobiography which was regarded as candid and trustworthy on the whole. The events of the reign were recorded by several contemporaries. The first place among these must be given to Dio Cassius, who stands to the empire in much the same relation as Livy to the republic. He became a senator in the year when Marcus Aurelius died (180) and retained that dignity for more than fifty years. He was well acquainted with Severus, and was near enough the center of affairs to know the real nature of events, without being great enough to have personal motives for warping the record. Though this portion of Dio's history no longer exists in its original form, we have copious extracts from it, made by Xiphilinus, an ecclesiastic of the 11th century. The faults which have impaired the credit of Dio's great work in its earlier portions -- his lack of the critical faculty, his inexact knowledge of the earlier Roman institutions, his passion for signs from heaven -- could do little injury to the narrative of an eyewitness; and he gives the impression of unusual freedom from passion, prejudice and insincerity. His Greek, too, stands in agreeable contrast to the debased Latin of the Scriptores historiae Augustae. The Greek writer Herodian was also a contemporary of Severus, but the mere fact that we know nothing of his life is in itself enough to show that his opportunities were not so great as those of Dio. The reputation of Herodian, who was used as the main authority for the times of Severus by Tillemont and Gibbon, has not been proof against the criticism of later scholars. His faults are those of rhetoric and exaggeration. His narrative is probably in many places not independent of Dio. The Augustan historians, unsatisfactory compilers, form a principal source for the history of the reign. The numerous inscriptions belonging to the age of Septimius Severus enable us to control at many points and largely to supplement the literary records of his reign, particularly as regards the details of his administration. The juridical works of Justinian's epoch embody much that throws light on the government of Severus.